Our son, Morgan, has been involved with Cub and Boy Scouts since he was a small boy. From the first year he began in Cub Scouts, he wanted to become an Eagle Scout. We knew this would take many years and many camp outs! That meant that food would have to be dealt with at Den meetings, and allergy awareness would have to be raised in the Troop when he crossed over to Boy Scouts. When my husband, Bob, was a boy he participated in Boy Scouts, and he very much wanted Morgan to have the experience of Scouting. Bob went to sign Morgan up for Cub Scouts and found out that snacks were a constant part of Den meetings, and most Den meetings in our area occurred in someone’s home. With Morgan’s multiple life threatening food allergies and pet allergies, it wasn’t going to work for him to participate at someone else’s home. Therefore, Bob became a Den Master! Food ceased to be a part of the Den Meetings, and the boys had a great time doing other Scouting activities. Scouting has been a great bonding time for Bob and Morgan. 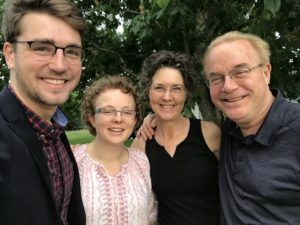 I’ve done my best to be supportive of the two of them, but I’ve stayed out of any leadership position and never gone on any of the camping trips or “field trips” that the boys have taken. It helped for Bob to be able to participate in all the activities and continue to increase awareness of food allergies. 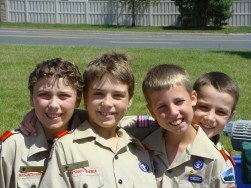 Many of the boys in the Cub Scout Den crossed over into the Boy Scout Troop. They and their families had heard about food allergies for years, and were so wonderful in helping to keep Morgan safe. In Boy Scouts, Bob became an Assistant Scoutmaster. Again, this allowed him to participate as an adult leader and to continue to allow Morgan to become self-sufficient around food. Boy Scouts do a lot more activities than Cub Scouts, so the need for food allergy awareness became even greater. The first Troop meeting I went to I presented to our PLC, or the Patrol Leaders’ Council, which is the team of boys that leads the Troop. It took about 15 minutes, and I explained what food allergies are, what my food allergies are, and how the Troop can help keep me safe. I made the same presentation to the entire troop a few meetings later, and they were very accepting. It was awesome! For every camping trip we have, I sit down with the patrol I will be eating with and we plan a menu as a whole. I then, with my Dad or Mom and perhaps some other scouts, go and shop for the food that is safe for me. People, even though they say they do, don’t understand food allergies and the risk cross-contamination is, especially on a camp out. There has been only one camp out, out of 5 years (almost 40 camping trips), that has been an issue, and it was only a miscommunication with a parent, who went and tried to buy safe food. In that case, I did bring my own, safe food, but I still participated in the camp out just like any other boy. I hope I can shed some light on managing food allergies from an Assistant Scoutmaster’s perspective. I have been in Boy Scouts for over 5 years and 3 1/2 years in Cub Scouts. I was also a Life Scout as a youth. 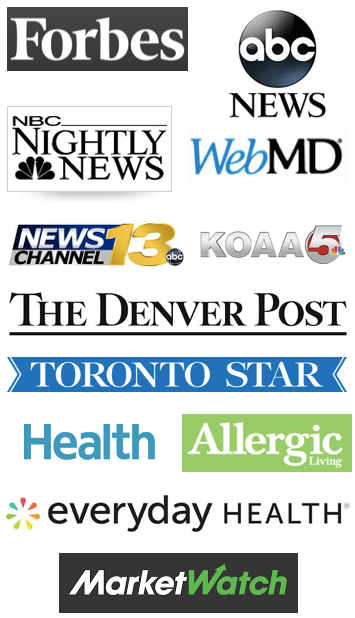 You will come into challenges as most of the adults do not understand food allergies nor do they understand the true ramifications of what can happen to a Boy Scout if he were to ingest or come near certain allergens. Every situation is different but my experience is the best tool I have at my disposal, as well as education. The more educated they are about Food Allergies the more support you will receive. Most Scout parents all want to help, they just don’t know what to do. I will share my experience as to Troop food from an adult’s perspective. It is my experience in our Troop, the patrols set their menus. If Morgan happens to be that patrol leader, they are well aware in creating safe menus of no nuts, no peanuts, food made with any sesame, shellfish or fish. Heck most of them would live on Pop Tarts and Mountain Dew if we let them, but we help them to insure they are making complete balanced meals as outlined in the Boy Scout Handbook. It helps them attain rank advancement and they are required to plan a meal and cook a meal for their entire patrol. Morgan is the one that usually buys the food for a campout so he can read the labels of the food he is buying for the patrol. (They all pitch in the monies equally) This affords him to feel safe and empowered by being able to advocate for himself with the knowledge that what he is going to eat will be safe. We make sure he gets to shop or he brings his own food when we backpack. Also even though other parents think they will buy the right foods, the problem is many times we have found that manufacturers change ingredients and do not tell anyone and the food now is not safe. Other parents’ intentions are right, but their lack of knowledge is something they don’t know. In Scouting nuts can be a big factor because when you are backpacking or camping, most boys bring trail mix. They know not to sit near Morgan when they eat it and to wash their hands after, but they are aware to keep Morgan safe. Most of the boys (50+ in our Troop) are very supportive of Morgan and they work hard on informing him if they are eating nuts or something that he is allergic to. This works well. Lastly, the only other thing you have to watch for is cross contamination. If you ever looked at a stove when a “Boy Scout” got done cooking, the HazMat team should be called in to clean it! In all seriousness, if someone is using a spatula from one pan and it goes in another, Morgan knows not to eat any of it, unless he knows ALL the food is safe. Scouts and their parents are very supportive of Morgan with his allergies. It also helps now that Morgan is 16 years old, an Eagle Scout and a junior assistant scoutmaster in addition to being a good leader. They listen to him more. Morgan had always been a good leader in helping younger scouts achieve things, which is why I believe he gets a lot of respect from both the boys and the adult leadership team. In terms of Boy Scout camps, such as Camp Alexander near us in the Rocky Mountains or the National Jamboree that Morgan attended in 2010 at Fort AP Hill in Virginia, a different set of issues are presented. Even though Morgan has had contact reactions with his food allergens – especially fish and peanuts – we did not ever ask that none of these foods be served at the Camp. Instead, we figured out a way to prepare safe foods for him to bring with him to camp and made the EMT’s at the camp aware of his severe food allergies. With the great outdoors, he has never had a problem with contact reactions at a Scout Camp. We would discuss cross contamination and safe food preparation with the kitchen staff when we dropped Morgan off for camp. Most of the time, the camp staff would prepare his meal based upon his index cards, even heating it up in a microwave for him. The only time we ever had an issue was when Morgan ran out of food the night before he was to come home from camp. The chef prepared him more broccoli to eat with dinner, and he soon got a stomach ache after eating it. He was taken to the medic tent who gave him Benadryl because no breathing problems were evident, and he soon got better. We never figured out why broccoli would have made him feel sick, but chalked it up to either nerves on his part or lack or complete cleaning on the part of the kitchen staff. From that time on, I sent WAY more food than I thought he could eat in a week, so we never had to deal with that again! 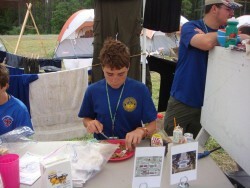 When Morgan went to the National Jamboree in 2010 along with 42,000 other Boy Scouts and Scout Leaders, the preparation of food was much more difficult. We live in Colorado, and the National Jamboree was in Virginia. It would be impossible to send all the food for 10 days worth of camp prepared at home and shipped across the USA. This time, my husband went out to Virginia on an airplane, rented a small hotel room with a kitchen, and prepared all of Morgan’s food. He then carted in 5 days worth of the food during the Jamboree, and did so again 5 days later. Their kitchen facilities were accommodating and kept the food refrigerated. Since Bob was an assistant Scoutmaster, he was allowed to be at the Jamboree to do such. Many of the boys LOVED the food that Morgan ate, and thought it looked much better than the food they were eating! He became very popular during those 10 days for his Dad’s wonderful cooking!! If your son wants to participate in Boy Scouts, I would encourage parental participation, especially on the part of Dad. It’s a great way to spend time with your son, and it also allows Dad to be part of the food allergy solution without your son feeling you’re hanging over him. Bob and Morgan hoped to attend Philmont Scout Ranch, a Boy Scout high adventure camp that involves 12 days of backpacking through northern New Mexico. Morgan planned on bringing safe freeze dried food since no refrigeration is possible. However when the Philmont menu came out, it was clear that peanuts and tree nuts were to be served at EVERY meal – in granola, cookies, or just stand alone packets of salted nuts. The fact that every participant would be eating these foods (other than Morgan) made it virtually impossible for Morgan to let down his guard and enjoy the camp. Therefore, Bob and Morgan decided to go on their own, private hiking trip where this issue wasn’t involved!